Daffodils surround the To Life sculpture, by Alfred Tibor, in the Governor’s Residence gardens. The sculpture was done in memory of the children who died in the Holocaust. One of the cherry trees in the gardens is the descendant of the cherry trees brought to Washington, D.C. by First Lady Nellie Taft. Here at the Governor’s Residence we have been busy getting ready for the Easter holidays. It has been a beautiful and warm week so all the wildflowers are really starting to pop out in the gardens. Yesterday I saw some beautiful trilliums — Ohio’s official wildflower — blooming. The Lenten Rose was nipped by some of the earlier frosts but now it is in full bloom in front of the house. I saw some tiny buckeye trees opening their first tight buds. The daffodils are open and magnificent on the mound surrounding the “To Life” family sculpture, by Alfred Tibor. 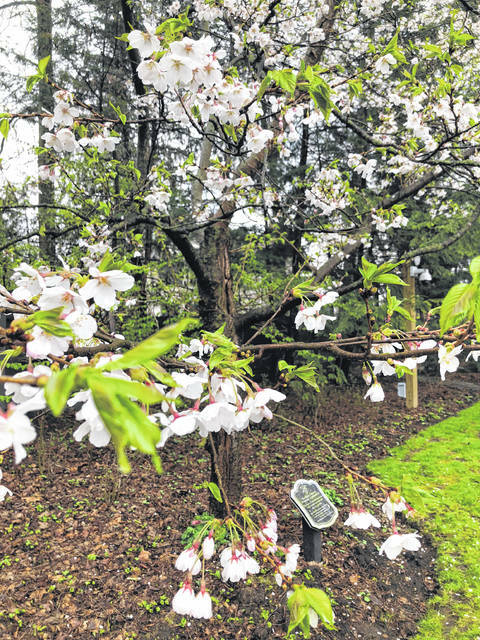 The cherry trees, one of which is the descendant of the cherry trees which were brought to Washington, D.C. by First Lady Nellie Taft, are just now dropping their petals as it rains. The bluebells are coming up everywhere. And the red buds by the front window are popping open. The turtle has been sunning itself on a log in one of the little pools. And the birds are singing away! We have lots of volunteers here today as we prepare for an Easter Egg Roll on the lawn for our legislators’ families, as well as the families that work for us. I thought it would be a great time to have the children see some of the magic in the yard as it comes alive in the spring. And I thought it would be fun to do the traditional Easter egg rolling, egg relays, and Easter egg hunt on the lawn. We’ve been busy in the kitchen making carrot muffins, Babe Ruth bars, banana bread, and some gluten-free little almond cakes! The Babe Ruth Bars have long been a favorite of my kids, and one of the treats I liked sending to them in college because they pack so well. They are really a peanut butter rice krispie treat. The recipe calls for a melted chocolate chip-butterscotch icing, but sometimes I do just the chocolate chips, or no icing at all. I also always like to have a gluten-free alternative. The almond cake is perfect for that. I use almond flour. This can be made into small loaves and sliced, or into muffins. Some sliced almonds sprinkled on top before they are baked makes a nice finish. As I finish the preparations for the Easter Egg Roll, I am also looking forward to my Easter dinner, and thinking about what to make. I’m pretty excited that there is a rhubarb patch here in the garden at the Governor’s Residence — just ready to pull in time for an Easter pie! Bring sugar and syrup to full boil. Remove immediately from heat. Mix in peanut butter. Add cereal. Press into buttered 9 x 13” pan. Melt chips over hot water. Spread over first layer. Cool. Cut into bars. Spray spring-form pan with cooking spray. Pour in batter. Bake 30 minutes until edges are brown and center is done. Cool. 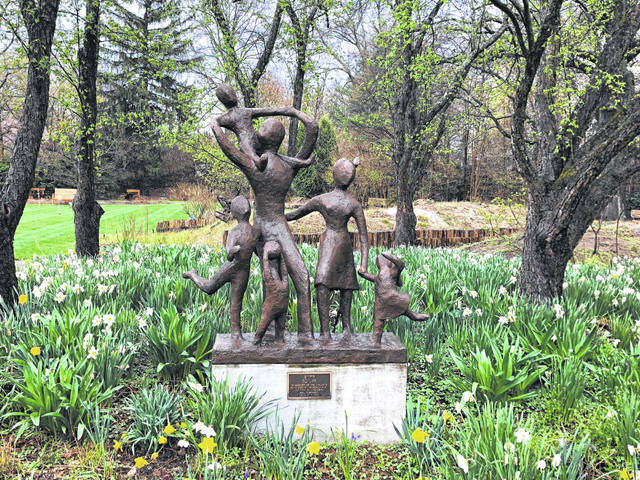 https://www.fairborndailyherald.com/wp-content/uploads/sites/50/2019/04/web1_ToLife.jpgDaffodils surround the To Life sculpture, by Alfred Tibor, in the Governor’s Residence gardens. The sculpture was done in memory of the children who died in the Holocaust. 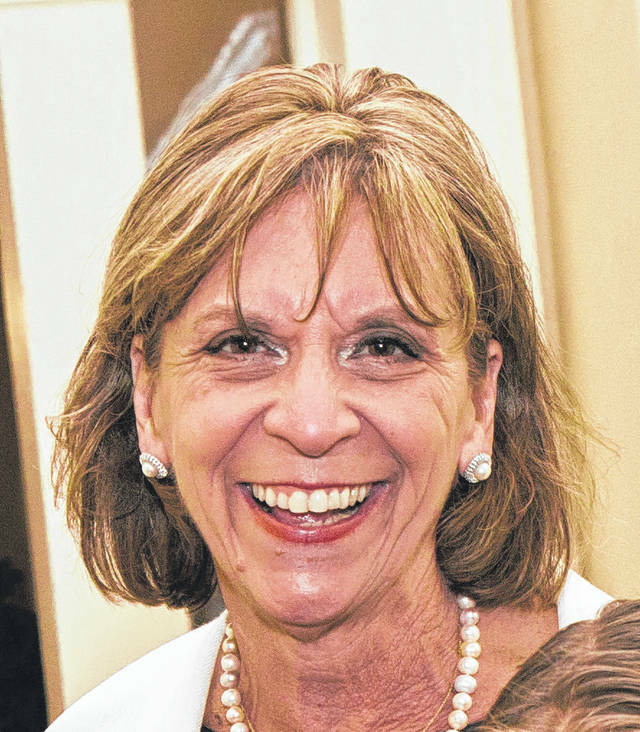 https://www.fairborndailyherald.com/wp-content/uploads/sites/50/2019/04/web1_Tree.jpgOne of the cherry trees in the gardens is the descendant of the cherry trees brought to Washington, D.C. by First Lady Nellie Taft.